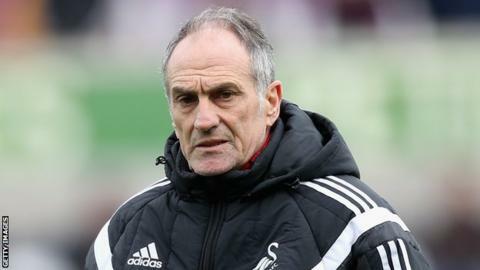 The future of head coach Francesco Guidolin will be discussed at a Swansea City board meeting on Wednesday. Guidolin was a surprise appointment as head coach in January but has guided the Swans to Premier League safety. The 60-year-old Italian wants to stay, and chairman Huw Jenkins confirmed the matter will be on the agenda. "We have got our normal monthly board meeting on Wednesday and, yes, we will be discussing the managerial situation," he said. Swansea's 4-1 win at West Ham lifted them to 11th in the Premier League table a week after a 3-1 home win against Liverpool secured their place for next season. "It could be this week or it could be next week when a decision is made," Jenkins told the South Wales Evening Post. "There's lots to talk through. We will talk about the season we have had, where we have finished and what we feel we need in the summer." Former Swansea manager Brendan Rodgers - who left to manage Liverpool in 2012 - has been heavily linked with a return to the Liberty Stadium. The Northern Irishman disclosed in January that he had been approached by Swansea to succeed the sacked Garry Monk, but he said that he wanted to take a break from football until the summer. Since then Guidolin, the former Parma and Udinese manager, has done his chances of holding on to the job no harm with seven wins and three draws from his 15 games in charge. "He (Guidolin) has brought exactly what he thought he would bring to us," said Jenkins. "He has brought in a bit of common sense and a bit of simplicity, as well as experience. "I don't think those simple things are highlighted enough in the modern world of football."